Around a year ago I moved into my own house on Milton Road in Cambridge. I know that I am very lucky and fortunate to have somewhere secure (in all senses), healthy and practical to live and I’m aware very many in the city and beyond do not. When I moved to somewhere decent I thought I should write about my previous experiences of accommodation in the city. That’s something I’ve not got round to doing until now. Everyone makes their own decisions, some take on huge debts and decide to have what they want younger and pay for it later; some pursue making money to the exclusion of all else, others take alternative paths such as spending all their cash as they earn it renting a fancy place then complaining on national TV they can’t save for a mortgage deposit. I, as everyone does, chose my own route and balance, though it never really felt like a choice. People living in inappropriate accommodation is big problem in Cambridge. I’ve seen some pretty poor housing arrangements in my time in the city. One of the most shocking was an English teacher living in an shed behind one of the houses on Newmarket Road which back onto Tesco. Beyond putting a bed, a microwave and a rigged up shower inside the shed hadn’t been particularly converted to make it habitable, it was, for example, entirely uninsulated single brick with a single skin corrugated roof. In my experience large numbers of people studying or doing important jobs, key to the functioning of the city, in Cambridge live in such, or otherwise undesirable, conditions. People often don’t speak openly about how they are living, on a number of occasions I’ve noted the contrast of people emerging from relative hovels in the city looking smart and professional and off to work in a very different world. While shed living is towards an extreme end of the spectrum I’ve also come across rooms without windows; rooms without access to proper cooking facilities where washing up is expected to be done in the shower and over-crowded houses, the latter particularly with language students. I’ve had a number of housemates who couldn’t cope with shutting doors and securing the house. One would cry if asked to make sure she’d locked up before leaving the house saying it was more than she could cope with; another would regularly walk in and not close the front door behind him leaving me to come home on more than one occasion to a dark house with the front door wide open wondering if there’d been a burglary. One would go out on a weekday evening and bring back tens of drunk people who she wouldn’t be in a fit state to control or prevent from being very loud. I was even driven to leave the house on a couple of occasions; someone else living in the house had to get up and do a day’s teaching after such a night. The vast majority of those I’ve lived with struggled with Cambridge’s recycling rules; regularly putting things in the green bin that someone else would have to fish out. One refused to put out the bins unless we kept them right by the pavement so they would only need to be moved a minimum distance. A few of the girls I lived with have reasonably insisted on bins in the bathroom but were not been willing to empty them, ever. I once came home to a kitchen splattered with blood and my most prized kitchen knife broken and bloody on the counter. One of my housemates had been trying to open a can; unaware of the existence of a can opener. I’ve lived with a fair number of people who’ve claimed that no cleaning ever took place in the homes they grew up in, so they didn’t see the need for cleaning now. One, rightly noted the house was too grotty to ever get really clean, but then concluded that meant they shouldn’t play any part in cleaning it at all. Another argued against doing their share of cleaning by insisting that their use of the kitchen didn’t contribute to it getting dirty. Stuff getting damaged is inevitable; but on a number of occasions I’ve had to fix, or get fixed, things others I’ve lived with have broken. Once my barbecue was borrowed without my knowledge only for the borrower to announce afterwards that they don’t clean barbecue grills (fair enough some people don’t; but I do and it started fine); on that occasion many of my kitchen implements were destroyed through use on the barbecue too. One girl, funded by her father, would repeatedly spend huge sums shopping at Waitrose, then leave a large bowl of fresh food untouched almost entirely by her for a period of a few weeks over which the rest of us would throw away items as they rotted, then when it was empty she’d buy a load more. I think generally when it came to rent I was very lucky, not making any major losses, but even those with good jobs would sometimes expect the rest of us to cover for them paying their share of the rent late, and the girl funded by her father thought “my dad hasn’t given me my money” was a reasonable response when asked why she hadn’t made the agreed payment into our shared account. One guy insisted on cooking in a manner, involving maximum heat and huge quantities of oil and vinegar, in such a way as the whole kitchen would be coated in a film of grease, which would be, with no exaggeration, 5mm deep on the cupboards above the cooker within two weeks of them being cleaned. He wasn’t capable of cleaning up the mess he was creating. I could go on; large amounts of raw chicken “juice” soaking everything in the fridge, bulky belongings being left when people moved out, attempts at (and actual) subletting, an individual trying to renegotiate the contract so they get a bit of their rent back from the landlord, complaints the kitchen was “too bright” after it had been cleaned, not grasping washed up items need to be left upside down to dry etc. etc. (I could probably write a book). These were almost all people studying or working at, or recently graduated from, the city’s universities, some in highly responsible professional jobs; many of them we’d made some attempt to “vet” and some even came “recommended”. Sharing a house rented as a whole is a major joint financial commitment; and when others don’t pay their share, or damage things, it can get expensive. A significant risk I thought was with the individual who was cooking in a manner incompatible with the kitchen, and deeply ingraining it with grease; if it had gone on serious damage could have been caused and the landlord would have been within his rights to bill for a new kitchen, or more. I actually lived with two people who cooked in such a manner, both Chinese. I have heard of houses both in Cambridge and elsewhere being seriously damaged by this kind of cooking, more suited to outdoors or an industrial kitchen perhaps, being conducted daily in a typical UK house. I never made race or nationality a factor in offering someone a room to rent in the house, and think a civilised society (and our housing our law as I understand it) requires a lack of prejudice based on race or nationality and treating people as individuals on their own merits, but had I experienced this kind of thing repeatedly I can see how it might have been tempting to reduce risks to my own finances and time, and in an effort to keep myself afloat, with a place to live, refuse to allow Chinese people to rent a room in the house. Ideally you would find out if someone was able to live in a shared house, but people don’t honestly answer questions so its hard to determine that for sure. When your own accommodation and hard earned money are at risk race and nationality based prejudice in an effort to reduce that risk can appear to be a good idea. I think that’s a point worth making because often I think people living some types of lifestyle find it hard to understand how anyone could ever consider race or nationality based prejudice could be a good idea. I’ve on occasion, in relation to times when the kitchen was being coated in thick grease or when there were regular loud gatherings I felt I had to consider if when someone left, it was fair to advertise a room and bring someone else into such an environment. On occasion it was actually so bad I didn’t when I had an opportunity to wait just a few weeks before someone else was leaving too. Living in an environment such as that illustrated by my experiences above makes it harder than it otherwise would be, with more appropriate accommodation, to function as a professional, establish a career and move on, however this is the kind of thing many of those living in Cambridge are facing. Cambridge University college accommodation varies drastically; some is akin to what I imagine a five star hotel might be like (including laundered fresh towels! ), other elements are badly and unfairly managed utterly impractical places to live. Some of the worst places I’ve lived in the city have been college accommodation: in terms of filth, safety, practicality and the way it was managed. I’ve been shocked to find descender fire escapes and waiving of fire safety rules. One college charged rent on an arbitrary basis. Paying hefty rents while the person in a room next to you pays none, was something I saw people who’d previously held high-flying jobs (returning to Cambridge for Masters degrees) reduced to tears of the unfairness of. A college has also taken around a decade to return my accommodation deposit. I have suggested previously that the colleges’ exemption from HMO regulation by Cambridge City Council should not be applied for rooms which are let for more than say thirty weeks a year. Strong students unions, as well as effective regulation by the Office of the Independent Adjudicator in Higher Education and the Higher Education Funding Council for England could also improve conditions for those living in college accommodation in Cambridge. See: Regulation of Cambridge University College Accommodation and North West Cambridge Development for more. I think there are a very large number of factors, which interact, to provide the accommodation situation we have in Cambridge. There is no easy, overnight solution to the city’s housing problems. Specifically in relation to house sharing I have suggested a Housing Act Amendment Bill to Cambridge’s MP when he got a chance to propose a new law in parliament. I don’t have all the answers, but think we need to update the law to reflect the fact people are living in shared houses for longer, in particular I think there should be clear default positions for what happens where there are no relevant overriding contracts. I have recently heard of letting agents charging over £400 for starting or amending a contract for a shared house; I think that’s something which needs to be tackled. At the very least all such charges ought be made clear from the outset. Voter registration and council tax billing are not shared house friendly. Household voter registration forms require someone to sign to say all the information on the form is accurate. This can be problematic if someone in a shared house doesn’t want the state to know where they are (for example if they are awaiting a decision from the Home Office on if they can stay in the UK). In relation to council tax, I have experienced Cambridge City Council making the landlord, rather than tenants, liable for council tax in situations where the Local Government Finance Act does not permit them to do so. I believe this is being done to improve the headline percentage rate of council tax collection but has no effect on the actual amount collected and disenfranchises those in targeted shared houses who no-longer receive council tax bills or other communications and information sent only to those who receive council tax bills. I would like to see new developments containing a variety of sizes and styles of property, including some which would be, by virtue of their size and type more affordable to rent or buy. I think this would increase the range of properties available in the city. Councillors don’t stand up enough to developers who obviously have an interest in building what is most profitable for them. I would like to see proactive planning of development in back gardens; with a view to co-ordinated development (rather than living in sheds) where densification is occurring in city centre streets. In some cases this could result in the construction of a new terrace of houses rather than allowing the disordered organic growth of “shanty towns”. I’m concerned that the new developments around the outskirts of the city are poor quality, sprawling estates, and not genuine extensions of the city, with the range of accommodation types, facilities and employment found in the established parts of Cambridge. Prices of homes being too high as a multiple of average incomes is at the core of the problem. One of the factors driving house prices up has been people taking out unaffordable loans. This is something we as a society have not only had to pay for in bailing out the banks, but though the consequences of high property prices. I think we need better financial education in schools. I think education could be an even greater social leveller if there was more formal teaching in areas such as money (and health too) rather than assuming people’s parents will teach them or they’ll be able to work it out as they go. I don’t think capping the numbers of shared houses in the city is a good idea. The effect of this would be to push up housing prices for many of those in Cambridge who find it hardest to afford even remotely suitable accommodation. The pool of properties available to students and working sharers would be drastically reduced if proposals which have previously been suggested, such as requiring planning permission for a shared house, became council policy. Improvements to cycle infrastructure within the city (the Chisholm Trail) and better connections to the surrounding villages, might well have a significant impact; increasing the area within which people look for accommodation giving them greater choice. From the perspective of an individual looking for somewhere to live making more properties accessible to them effectively increases the “supply” side of the supply and demand model. For Cambridge to be a happy and productive place the city’s accommodation problems need to be addressed. Those who advise me on libel matters have suggested that writing about the fact I have a house is a bad idea; as it suggests I might be a worthwhile target for taking legal action against. I try not to let the terrible state of our libel laws affect what I write and do too much, and suggest those seeking to make some cash out of a libel case or threat could find plenty of much better targets. @andrew_mcdonagh @RTaylorUK without the busway cyclepath the cheaper rent out in Willingham wouldn't have been a practical option for me. To extend my own story a bit. I used to live in Hitchin but about 18 months ago had to move. As I was working in Cambridge it made sense to move up this way and eliminate the pain of the train journey. Our search area included all of Cambridge town and also villages along the entire stretch of the busway out to Swavsey as I figured this was a reasonable cycle commute for myself. (I work on Cowley Rd, so general business/science park area.) As we didn’t possess a car this whole area would simply not have been an option without the busway. I cycle into town quite happily from Willingham thanks to it, saving over £1000 in busway fares per year. I have cycled in/home via Girton & Longstanton on-road a handful of times and don’t consider it a safe or pleasant alternative (and I’m a relatively experienced and confident road cyclist). Note that in our case we’re not forced out to Willingham for financial reasons. But rather it provides a better quality (as we measure it) of life for a cheaper price. A two bedroom house with a decent garden and kitchen in Cambridge town akin to where we’re living in Willingham would be >£1000 per month. Here it is <£800. Including my savings on the busway thanks to its excellent cycle path this represents a saving of probably more than £4k per year. Money in the bank. I’ve invited Simon Webb to expand on what happened in the comments here. Stuart Tuckwood, a nurse at Addenbrookes, has spoken about how his mother said: “I don’t know if I could live like this” on seeing his shared house in Cambridge. I just read my article back through and I don’t think I mentioned the time when a gas safety inspection in my rented shared house involved moving the gas hob; leaving the dodgy connection leaking. The first of my housemates to get up smelt the gas in the kitchen and responded only by opening a window before going out; not thinking to wake anyone else up or turn the gas off at the mains. Also while I included I photo of a rat I didn’t mention that the rats ate through electrical cables under the floor boards leaving them sparking. @RTaylorUK Interesting read, thanks for sharing. I've many similar experiences regarding shared accommodation and landlords. @RTaylorUK A landlady who regularly entered our flat unannounced and would leave notes complaining about mess, or unwashed dishes. In one college’s accommodation I stayed in (I won’t say “lived”) they had a rule requiring almost daily access to rooms (I think you were allowed to say no a couple of days a week), which was very intrusive. @RTaylorUK When I complained, she threatened us with immediate eviction, a week before Christmas. 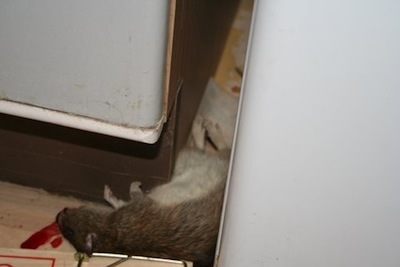 @RTaylorUK A letting agent who kicked a dead mouse under a couch when showing me round a flat to try and hide it from me. @RTaylorUK A landlady's cowboy handyman we endured for months, following a huge fire in an adjoining flat causing damage to my property. @RTaylorUK A housemate who asked me where she should empty the bins to, to get rid of her rubbish, after 18 months in a house together.